If you're looking for paint colors to sell your home, start by focusing on colors that will highlight your home's best features. Showcasing your home's beauty should be the focus of any home improvement aimed at resale. You don't know who is going to walk through your front door, fall in love with your home and buy it, so painting to appease a potential home buyer is a bit of a struggle. Selecting a neutral palette can be off putting to those who enjoy color, while bright, vivid tones can be off putting to someone with more quiet tastes. So how do you select paint colors to sell your home? You start by painting to your home's style, and maximizing its assets. When an architectural style, such as Victorian or Craftsman, is first created, the architects choose more than just the building materials and details. The colors of the home are included, too, frequently reflecting the mood of the current society and the philosophy of the builder. Victorian style homes were originally painted in somber colors, which were created by adding a small amount of black paint to the true color. The effect was reminiscent of the gravity felt through society at the time. To properly paint a Victorian home, be mindful of painting in its original color palette, while following the interior and exterior painting cues the home gives. Craftsman style homes are built from materials in the surrounding area. Paint colors were frequently selected from this nature palette as well, with the colors of hills, sky, ponds and trees finding their way indoors. When you begin your paint selection process, make sure you paint to your home's built-in color scheme or paint palette. Finding the colors used by the original architects and reintroducing them into the home can have a cohesive effect on the entire design, which is visually appealing to the viewer. Keep in mind that most homes are painted in a variety of colors, meant to work together to produce one complete look. These paint palettes can be tied to the age and style of your home, or they can be used to create a "color story" as you move through the rooms. A consistent paint palette can help sell your home more effectively than a bunch of randomly painted rooms. A monochromatic color scheme selects one color, and moves up and down on the color chart to find coordinating tones. A graduated color strip will show monochromatic colors moving from light to dark. Painting your home in a monochromatic color palette is a safe choice to make, provided that the colors work with your home's architectural style and your neighborhood. An analogous color palette is formed by taking colors that are right next to one another on the color wheel. Red, orange and yellow are analogous colors, for example. Selecting shades of analogous colors may be a great choice for some Southwestern style homes, or homes that are trying to provide a warm and welcoming effect to potential home buyers. Complementary color palettes are made from colors that lie opposite one another on the color wheel. These color palettes work best for accents, or for highlighting a home's features. For example, a complementary color palette works well on a home's exterior, or if you are creating an accent wall in an interior room. There are as many "correct" color palettes as there are home styles. A color palette that is going to help sell a Victorian will be unlikely to do any favors for a modern loft. So, when it's time to figure out the color palette you want to work with, take a few things into consideration. Play up your home's architectural strengths by highlighting them in colors that may have been used by the original architect, or updated versions of the same palette. This should be true of your home's exterior as well as the interior, since curb appeal has a big impact. Avoid dark colors in small spaces, since they may make a small room seem even smaller. Use warmer colors in very large rooms, or rooms with high ceilings, to provide a more intimate feeling in the space. Adjust the colors as you move through the home to ensure that each space is shown off to its best advantage. Your home's curb appeal extends beyond your front yard; it can have an effect on the whole neighborhood. A potential home buyer will not just be looking at your home; they'll be sizing up the whole block, so make sure your home's exterior color palette is in keeping with your neighbors to avoid a negative contrast. Beginning with your home's exterior is a smart move. Curb appeal is important. The exterior is the first thing that potential home buyers will see when they drive up, and it can help set the tone for their whole visit. Select paint colors for your home's exterior that are in keeping with its style, and with the neighborhood. Make sure that you highlight any details your home may have by painting them in a coordinating or contrasting color to the rest of the home. This can include eaves, gingerbread moldings, soffits or just the shutters and front porch. Whatever your home's best feature is, make sure to highlight it with paint. The home's interior should coordinate with the exterior, with the color selections outside setting the stage for what you'll find indoors. This doesn't mean that you have to use the same colors, or even variations of these; the tone and color saturation of the exterior colors should be carried indoors. Color saturation is the amount of true color in the paint. A pale, pastel green and a rich, vibrant green can be on the same color chart, but may not work well together when viewed side by side. This is because their saturations are different. For a cohesive design, keep your color saturations the same as you move from the outside in, and as you move through the home. Color tone is the next point to consider, and something that should be adjusted in each room of the home. Colors can be warm or cool in tone, with warm colors contracting when viewed to create a cozy or warm sensation. Cool colors recede from the eye when viewed, making them the perfect accent or room color for small or narrow rooms. Large rooms or high ceilinged rooms can benefit from warm colors, since they help to bring the home into scale. 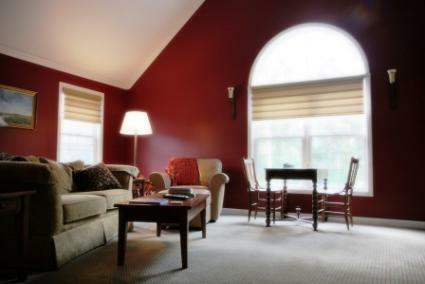 Warm colors are also beneficial since they will help a potential home buyer to feel more comfortable in a space. If the rooms of the home are smaller, cooler toned colors will help to enlarge them. Subtly changing the neutral shades as you move through the home can help to create a more inviting atmosphere than would be possible with just a single shade of white or beige. These three colors are frequently represented as apples and lemons in the kitchen, and are included in throw pillows in other rooms. The thought is that these colors have an effect on the potential home buyer, making them feel more at home in the space. Selecting paint colors to sell your home can feel like an enormous task. Make your first decision based on the style of your home and the area it resides in. Build off these initial selections, and you'll find a cohesive design that works for the whole home.